We’d love your help. 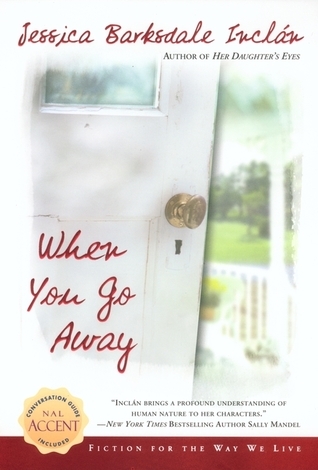 Let us know what’s wrong with this preview of When You Go Away by Jessica Barksdale Inclan. From the acclaimed author of The Matter of Grace and Her Daughter's Eyes-a novel about a mother of three who, abandoned by her husband, tries to run from her problems.. But when she returns, it's only the beginning of her family's journey. To ask other readers questions about When You Go Away, please sign up. I was sent this book and one other by the author (signed) after I won an ACR of her finale of the Beautiful Beings trilogy. It's possible that I didn't like this book because I'm not a mother. But even so, I found myself appalled -- besides the fact that this is (apparently) a jarring true story -- that a woman would simply abandon her three children, one of which suffers from a degenerative muscular disorder, after a breakdown. Besides the content and plot of the book, I couldn't get into the w I was sent this book and one other by the author (signed) after I won an ACR of her finale of the Beautiful Beings trilogy. This book was kind of lame and pretty much went on and on and on. I felt like it had an overall sympathy for the wrong person, but alas, it ended up being just like the story in real life would've been. In other words, it was really uneventful. This is an easy read. It speaks of a mother who abandons her children after a divorce and caring for 3 kids--including one with severe disabilities--as a result of depression with a psychotic break. Severeral intriguing issues but the author doesn't explore them in enough depth for my taste. The book was a fast read, it kept my interest and I wanted to see how it all ended. There were several intriguing issues but I would have liked the author to explore them more. What an intense novel. And I thought I knew how it would end, but I was happily wrong. A good solid story that I could not put down. I find this book somewhat difficult to review. First of all, I would like to congratulate the author on her ability to bring to light emotional family issues that rarely see the fiction department and for doing such a good job of making them prominent in her story lines. That being said, this is a good book, but in my estimation, not the most enjoyable one in terms of relaxing enjoyment to be had with a novel. Is it possible for fiction to borderline on being too real? I would have to say yes. W I find this book somewhat difficult to review. First of all, I would like to congratulate the author on her ability to bring to light emotional family issues that rarely see the fiction department and for doing such a good job of making them prominent in her story lines. Whereas much of the time I find it irksome that many fictional novels do not even come close to following the truth, this one was perhaps a bit closer to reality than I would have expected. Watching the turmoil of this family from a reader's helpless perspective was a hard thing to do. You want to hug the children, strangle the mother and clean up the mess before the end of the book, but there is naught that you can do but watch it unfold. I felt the author was very sympathetic toward the issues of the mother, and I could not be quite as kind. I just did not like her. I thought she was selfish and should have been handled in a different matter, but perhaps that is largely because I am a mother as well. "What happens when a mother of three, abandoned by her husband, one day reaches the breaking point and does the unthinkable - simply gets in her car and drives away? For Peri Mackenzie, that day comes months after her husband leaves, robbing her of all financial and emotional support. Months after she has been caring for her severely disabled daughter and her two teenagers with no help from anyone. While thirteen-year-old Carly does her best to handle laundry and her little sister's complicated medical routine, fifteen-year-old Ryan is too resentful to pretend that things are okay. It is their estranged grandfather, Carl - determined to make up for his own parenting failures in the past - who reaches out in unexpected ways. And it is Peri's return - and her fierce determination to win back the right to be their mother - that begins a healing process through which all their lives are made new." This was a difficult book to read, but I just keep thinking about it. It deals with the fall-out when a young mother gives way to depression after trying to deal with her divorce and caring for her disabled daughter and two young teenagers, all without any financial (or other) support from her ex, or from her own adult family members. The results of her "lost" week are long-standing and difficult, not only for her and her children, but also other for other extended family members on both sides. Th This was a difficult book to read, but I just keep thinking about it. The novel ends with a resolution of the issues, but one that left me unsure as to whether or not it was the "best" outcome for all concerned. (Much as often happens in real life.) Strongly crafted treatment of a painful, and, for many, uncomfortable subject matter. Definitely not a cozy; but recommended. So, a mother of three decides one day that she just can't take the pressure anymore of caring for her severely handicapped child and instintively knows that if she stays another minute that she will hurt somebody. She realizes this in retrospect but it doesn't make it any easier to try to win her children back when she has to go to court. It's very sad and truly makes me wonder how someone gets through each day caring for someone that is totally dependent on you for anything, and you know they So, a mother of three decides one day that she just can't take the pressure anymore of caring for her severely handicapped child and instintively knows that if she stays another minute that she will hurt somebody. She realizes this in retrospect but it doesn't make it any easier to try to win her children back when she has to go to court. It's very sad and truly makes me wonder how someone gets through each day caring for someone that is totally dependent on you for anything, and you know they will always be that way and never improve. I know I liked the book but was at my Grandmothers and couldn't get online to put in a review right away while the book was fresh in my mind. I'm trying to get the books i've read while away from home and put some sort of a rating and a review if possible. From Good Reads: From the acclaimed author of The Matter of Grace and Her Daughter's Eyes-a novel about a mother of three who, abandoned by her husband, tries to run from her problems.. But when she returns, it's only the beginning of her famil I know I liked the book but was at my Grandmothers and couldn't get online to put in a review right away while the book was fresh in my mind. I'm trying to get the books i've read while away from home and put some sort of a rating and a review if possible. Wow! This book is so much better than the other book that I have read by this author. Thank goodness. That being said I really enjoyed this book. It was heart wrenching without going so far into detail that your brain hurt. The emotions came across so strongly that I didn't feel like I needed to go deeper into detail about what everyone was feeling or had wrong with them. When a recently-divorced woman descends into depression, has a psychotic break, and abandons her 3 children (including a 5-yo with multiple disabilities), her family struggles to find a new way forward. This was very good, sad, but riveting. This was a pretty good book about a divorced mother of 3, severely depressed. She abandons her kids one day, leaving them to survive on their own. The story was decent, but the writing was fairly basic. Recommends it for: Anyone who enjoys a story about family. This was the second book I read by this author. I really enjoyed it. I felt bad for the children and sad to think that this happens in real life. Another good one from Jessica. She can get inside an issue like no one else and make you feel the logic behind insanity. It was heartbreaking, sad and yet very real. Didn't want to put the book down. REALLY liked this book. would most def recommend it! so go READ IT! Jessica Barksdale Inclan's fourteenth novel, The Burning Hour, was published by Urban Farmhouse Press in April 2016. Her poetry collection, When We Almost Drowned, is forthcoming February 2019. A Pushcart Prize and Best-of-the-Net nominee, her short stories, poems, and essays have appeared in or are forthcoming in the Waccamaw Journal, Salt Hill Journal, Little Patuxent Review, Carve Magazine, Pal Jessica Barksdale Inclan's fourteenth novel, The Burning Hour, was published by Urban Farmhouse Press in April 2016. Her poetry collection, When We Almost Drowned, is forthcoming February 2019. A Pushcart Prize and Best-of-the-Net nominee, her short stories, poems, and essays have appeared in or are forthcoming in the Waccamaw Journal, Salt Hill Journal, Little Patuxent Review, Carve Magazine, Palaver, and So to Speak. She is a Professor of English at Diablo Valley College in Pleasant Hill, California and teaches online novel writing for UCLA Extension. She holds an MA in English Literature from San Francisco State University and an MFA from the Rainier Writers Workshop at Pacific Lutheran University.